A child’s birthday is a momentous occasion that deserves a proper celebration. Florida folks know how to party, especially when it comes to honoring their children. Sure, there’s always the standard cake, balloons, and piñata, but having the right location can determine the party’s success and help make memories that will last a lifetime. These 10 best places for a kid’s birthday party in Florida not only offer an amazing party space, but many of them will even help with setup, cleaning, and party planning, leaving you to enjoy the party without the work. Set sail on this epic voyage in search of the bounteous birthday treasure. This pirate-themed party boat is perfect for kids and adults alike, taking you on a one-hour water cruise that lets your child and their guests become pirates on the high seas. Each child receives their very own loot stash, and the birthday boy or girl gets a few bonus goodies. Kids usually have a ton of energy at birthday parties, so why not let them burn some of it in a safe, healthy way? This kiddie gym offers tons of physical activities they’re sure to love, including obstacle courses, bounce houses, trampoline, foam pit and, more. When you book a party here, the entire gym is yours to enjoy. This indoor play place is a dream come true for kids and parents alike. Previous party-goers have mentioned the high level of professionalism and attention to detail from the staff, ensuring the parents never had to lift a finger. There’s plenty for everyone to do here, and you can customize your party experience to your liking. This posh day spa is just for kids. While it operates as a normal salon, you can book a private party and treat guests to a lush spa-like experience that includes facial, manicures, glitter tattoos, and more. They can host your group at the salon, or bring the party to you, whichever you like. This nationwide franchise has several locations throughout the country and three right here in Florida. Their unique indoor golf experience brings your ghoulish nightmares to life on this masterfully designed black light course. In addition, your group will have your own party room where you can quell your monstrous fears and enjoy celebrating another trip around the sun. There’s no shortage of activities for your young guests to enjoy at this fabulous indoor play place. From air hockey and video games to climbing structures and inflatables, your birthday boy or girl won’t want to leave. The hosts take care of everything, from setup and cleanup to passing out refreshments so you can spend more time enjoying the party. This isn’t your average laser tag. This multi-level interactive game features fog throughout and plenty of obstacles to give your guests a challenge. It’s mysterious, adventurous, and a whole lot of fun your child won’t soon forget. The fun starts from the moment you step inside. Whimsical colors and high energy music and lights leave your party wanting for nothing. Inside there’s an elevated ropes course, bowling, laser tag, arcade, rock wall, and toddler play area to give everyone of all ages something to enjoy. 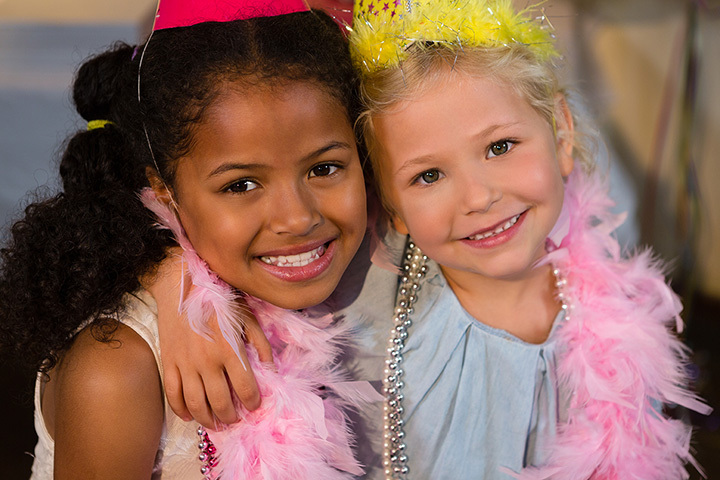 They offer several birthday party package options to fit your needs and budget. It’s just not a birthday party without cake, and each guest can create their own at Mia Cake House. This place has everything you need to customize your very own cake. They do all the messy work and your child and their friends get to have all the fun. You might just decide to have your own adult birthday party here too! Small yet vibrant, this indoor play place is among Florida’s most eco-conscious spaces. Ideal for kids ages zero to five, your party package includes time in the play space and a semi-private area for party business. They offer additional add-on activities, such as face painting, temporary tattoos, bubbles, a painting station, and others. Their extensive list of package options ensures you can create your child’s dream birthday party with minimal effort.